Bigfoot/Sasquatch sightings popularity around the world is still quite alive and well. So many different Bigfoot stories are depicted among the indigenous populations around the globe, which incredibly all sound considerably similar to each other. And these “myths” and legends still continue, as most cultures have similar giants in their legends and folklore. Many tales about Sasquatch are impressively similar, for example, many members of the Lummi tribe describe the creature’s diet as well as the creature’s activities, which only slightly differ among the members and local tribes. Some have described Sasquatch as a creature that caries people off and then feeds on them, others have stated that the Sasquatch are a group of cannibalistic wild men and some term the Bigfoot as paranormal/supernatural being. But far and large, Bigfoot/Sasquatch is known around the world as an actually giant ape/human like animal. Sasquatch has many different names which have been derived from various tribes, cultures and each community has its own local version of the creature, but are all based around the concept of a hairy man, ape man or wild man. Many locals around the Bluff Creek area for example have “witnessed” the Bigfoot, its foot prints and have had these foot prints casted and despite these casts it is still maintained that Bigfoot is a myth by skeptics. By the way, for the United States, Bluff Creek is where it all started for Bigfoot in our country. 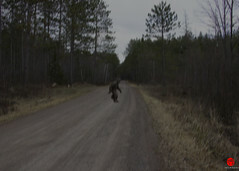 The Patterson Film (PGF) made Bigfoot a celebrity and set off the Bigfoot paranormal craze here in the US. Most claimed Sasquatch sightings have been reported from the Pacific Northwest and many in and around North America although Bigfoot is a worldwide phenomenon! There are sightings here in the US as far back to 1924, where miners claimed that they were attacked by the Bigfoot. And after writing a book on the incident, it was thought that these ape like creatures were from another planet and that these miners had experienced psychic encounters. Many scientists have compared the Sasquatch casts to that of bear foot prints and yet others claim there were no comparisons found among the footprints. Various scientists claim that the creature seen and verified as the Bigfoot is nothing more than bears that have a serious case of mange. Yet Bigfoot field researchers state that they have definitely seen juvenile species and have taken pictures to prove their sightings, which have now proved to Bigfoot believers that this is not a bear, as the creature looked more human than bear. Bigfoot is probably our distant relative, original people 500000 years ago.